It was 1972. Bruce Lee’s early Hong Kong movies were showing up on tv in the states. “Enter the Dragon” would be released in 1973. “Kung Fu” was the hit tv show. “Billy Jack,” a horrible movie with a wonderful sentiment and karate undertones, had been in the theaters. Americans were just starting to get a handle on this thing called Karate and Kung Fu. Judo and Karate had been known for some time of course. But for some reason Judo seemed to be more in the American psyche. We saw things like James Bond practicing Judo and then knocking out villains with a chop (“Goldfinger”). But Judo doesn’t really chop and Karate doesn’t really throw. I had tried Judo a few years earlier. It was a small school filled with large, grown men. Being a rather small kid, it did not fit with me very well at the time. While Karate had been around for centuries it was starting to become popular in the U.S. and I was becoming aware of it myself. One of the guys in my clique, Brewster, the ladies man as I have described him in other posts, was studying Karate. I expressed some interest so he invited me to tag along one Sunday. 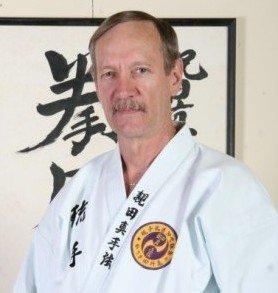 The instructor, Sensei James Logue, had been in the army and had just come back to the states after being stationed for several years in Okinawa. There he had trained under Taika Seiyu Oyata, and was the highest ranked Caucasian in Sensei Oyata’s style. We trained in a guy’s backyard. There was no organization per se. It was all very old school. Sensei Logue did not even charge us. He did reserve the right to teach only who he wanted to teach. He looked me over for the six hours we worked that first Sunday and then told me I was “allowed” to come back. I was honored. I trained under Sensei Logue for several years. He moved to another city where he set up a school. I trained there for a while eventually earning a brown belt in that style. But life became life. College, marriage, things like that, so I stopped training with him. But I did not give up my private practicing. After some of that life stuff I ended up with a wonderful young child. At age nine he was in a little altercation at school. Nothing serious, the kind of thing that happens to every kid at some point. His mom, my first ex, decided he should take karate or something. She called around looking for a place that taught the stuff that Bruce Lee did. The ex and I had been divorced for almost eight years at the time, the divorce having been finalized shortly after my child’s first birthday. One of the agreements of the divorce was that I would visit with my child every single day. I would go over to my ex’s house every evening and spend several hours with him. We would do homework or play games or watch tv together. The martial art classes were offered in the early evening. That was my time with him so I figured, fine, I’ll take him. Having some experience of my own but in a completely different style, I would sit and watch him. I would move and squirm wanting to help as my child worked with the instructor. Eventually the instructor suggested that I work with my child. Since they didn’t teach children anyway, it would balance out the classes allowing the instructor to watch the class while providing someone for my child to work with. Because of my prior experience, I took to the new art very quickly. It wasn’t long before I was not only helping out my child but helping out other students as well. In a few years I was teaching, not as a job but as a hobby. The instructor and his wife had long dreamed that they would someday do nothing but teach. The instructor owned a couple of muffler shops in the area. He and his wife worked them by day and taught and trained at night. They were saving and planning for the day they would open a real, official school. Tragically, the wife was killed in a motorcycle accident. The instructor was hit hard by this and I could tell he was about to pack it all up. He felt he couldn’t do it all anymore. I pulled him aside and said, “You are a good teacher. You cannot give up. You shouldn’t. Be a black belt. Don’t quit.” He persevered. I looked him square in the eye and said, “You f’ing idiot! Isn’t that what you have always dreamed about? Call him back tomorrow and take the offer.” He did and within a year he was laying plans to build a five-thousand square-foot martial arts facility. Eventually I was offered a paying job teaching and the rest is, as they say, history. It all started with that first day with visions of David Carradine as Kwai Chang Caine, and Billy Jack, and Bruce Lee in my head and I was given the honor to come back. I really liked this story. The picture honoring your first instructor was a great addition. Being part Japanese, I have the greatest admiration for people that understand and live by honor. All those names brought so many memories back of my Mom. She loved Bruce Lee movies, not to mention the other names in your story. She would buy the movies or TV series. Being German, she didn’t really understand some of the plots but she loved the fighting. My older brother took Kung Fu lessons and when my Mom took me to pick him up I would watch. It looked so cool but I am a big baby and hate to fall or get hit. Unfortunately when it came time for my brother to fight off several men (my brother was an adult by this time) he totally forgot what he learned. So did you practice the Nunchaku? Not sure if that is spelled correctly. Oh, did you ever have to use your skills? 1. Nunchaku (Nunchucks to Americans): I have trained with them, and taught them. That said, they are useless weapon that belong only to movies. Originally the nunchaku was a farm tool – a rice thrasher. 2. Use of skills: As I teach martial arts, that would be one use. As for what you meant, I have been in 3 street altercations. In one I used the calm and clear thinking to evade the fight. In another I ran to a woman’s defense and was able to stop the beating she was receiving while at the same time avoiding any blows with her attacker. In the last, I apprehended a shop lifter who used a snake as a weapon against me. (I guess that is a story I will have to write a post about.) I also “used my skills” as I helped to self-police the Occupy Columbia movement. All that said, I am certain that a great many altercations have been avoided because my training allows me to understand what combat is, and provides me with a presence and calm that drives me to find ways to diffuse, avoid, or evade. Like anything in life, if you don’t keep working it, using it, you lose it. If you snooze, you lose, as the old saying goes. While your brother forgot all of his techniques, if you ask him I imagine that he will tell you there was a calm or confidence in him that he can trace back to his Kung Fu training. I’m glad you enjoyed the post. Thank you for reading and adding.